Sorry. You just cannot win big with our coaches. I've seen enough. This is who they are as play callers and utilizing talent where needed, and this type of stuff is what holds even the most talented of teams back from going much, much farther in the postseason. Sure, it looks good between the 20s, but I've had enough. They do not appear to have learned anything or grown at all as play callers. Very happy Jones got the TD, but that doesn't erase the epic horridness of the red zone play calling. Game after game. You cannot make a living with play callers like the ones we have. It may get you through the regular season and set you up year after year for the postseason, but then it cost you big time. Problem is, with regular season success, the play callers won't learn anything and chalk up postseason losses to just not being good enough. Well, that call worked. Should be dominating this game on the scoreboard . At least that TD counts. Huge for going into the second half. Thank you Fletcher Cox for that TD. They used my FB idea with Kelley at FB and Jones at RB. Worked like a charm! yep, two timeouts, on the 4, let's try 3 straight passes. That's not smashmouth, it's smash my tv remote. Davis' excessive celebration penalty led to the Eagles' TD return, and the Cox personal foul enabled the Jones' TD. Cousins has thrown one bad pick in every game save the win over the Giants - yes? Not really because we woulda gotten a FG that drive anyway. I guess it's just all the Redskins games are gonna be gut wrenching this year. Without the penalty, Hopkins does his job and there is no return for a TD - yes? Makes me wonder if we can cover kicks worth a darn - that's for sure! This year? Ha - it's been the norm for the past 25 years. We HAVE TO win this game!! True. Feeling better that the lead is 7 and not 3. And that Cousins is not hurt by Cox's violent hit and tackle. Yep. You cannot drop to division games at home. Just can't do that. Our road win vs. the Giants would help ease the pain should we lose this game IF we sweep the Giants this year. But we have to win this game, no question. Davis screwed up with the celebration, but Kowitca compounded the error with one of his own. He tried to get cute with the high, short KO and it came back to bite us. If he had let Hop rip it, it would likely have gotten to the 5 yard line if not the EZ and this isn't an issue. Oh well. We have dominated both sides of the line. And we have a very fresh D to start the second half. Ryan found he likes the taste of Eagle meat, and wants more. Did anyone even touch Jones on that play? Just breathe on the guy and he goes down. Love Garcon. He is the most money guy on the team. Garcon and Reed. Crowder is becoming so also. Ross and Grant are worthless. We need to work on replacing those guys soon. Want to see more of Fat Rob on early down runs! Thompson running hard today. How is it that Thompson can break tackles and get more YAC than a man almost 100lbs heavier than he is? Running game is looking so good today, our play callers better not abandon it. Refs still owe us for calling Thompson down on that one play. Jeez...if you are going to have replay, make EVERYTHING reviewable. Now if we can get you an office next to Jay's, we'll have something to be excited about. Yeah, if you're going to have a big RB, using him as a FB makes good sense. Score a TD here and we've made up for a lot of those horrid points by the Eagles. OMG, that was close. Come on, Kirk! 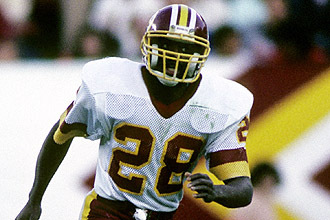 Do the Skins ever do playaction? Defense should be REALLY rested. Hope they can come out playing with the same intensity. Yep. And if there is no growth there by the play callers, it's going to hold us back from achieving what Scot is working so hard to achieve. KC forces one and almost gets intercepted. here's the thing. Barry has done a good job adjusting the Def to play tighter in the 2nd half. but the Iggles haven't run any plays. so does that mean he won't adjust until OT?